Doesn't he totally look like he's saying, "Honey? What honey?? Why I haven't the foggiest idea what you mean." I used the Ornament Punch to make the honey jar, just trimming the bottom flat, and then cutting some other contrasting pieces off another Ornament Punch. I made little lines with the Chocolate Chip marker, and inked up the word 'honey' with it. (the image comes from a phrase in the Just Buzzin' By stamp set) Then I used the Word Window Punch to trim out the word. 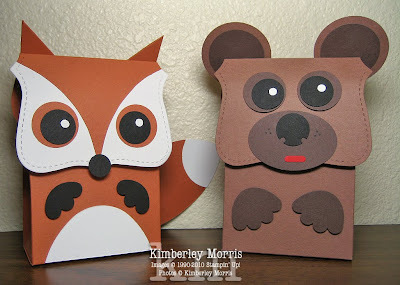 I know that's a cheesy title, but I have a couple more animal boxes to share with you...one is a fox, which has been upgraded from the original by layering the eyes, and adding a couple of little paws. The other is a bear I designed a while ago and forgot to post! You can download the basic PDF instructions for making the fox box HERE. To upgrade the fox, I simply put a small circle of Whisper White card stock behind the hole in each eye, so it would show through for the highlight, then layered that on a 1" Circle Punch of the Really Rust card stock I used for the rest of the fox. The paws are made with the Scallop Circle Punch--just punch that out in Basic Black, then take a "bite" out of the scallop circle that's 3 scallops wide, using the Wide Oval Punch. 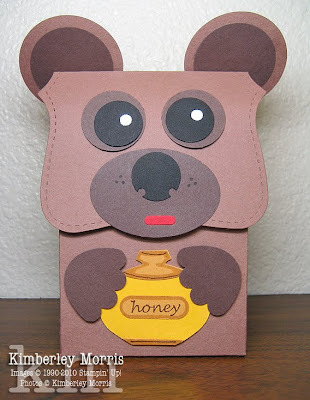 The bear was made with Close to Cocoa, and Chocolate Chip card stock, with a little bit of Whisper White for the highlight of the eyes, and a little bit of Real Red for the mouth. The mouth was punched out with the Horizontal Slot Punch. The nose is just a 3/4" Circle Punch with a couple of punches taken out..you can stick the circle into the side of the Horizontal Slot Punch to get the nose holes. The Wide Oval Punch makes the perfect size muzzle. I did use a Basic Black marker to add the "freckles", and the ears are 1-3/4" and 1-3/8" Circle Punches layered. The bear's paws were made just like the fox's paws, only I took a "bite" out of a Scallop Circle Punch that was 4 scallops wide instead of 3. Purchase your supplies in my ONLINE STORE today, and get a free Sale-A-Bration item for every $50 you spend! 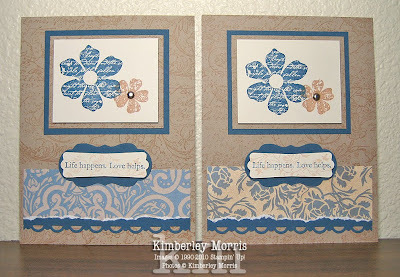 The cards are identical except for the pattern on the Bella Bleu Designer Series Paper (DSP). I had to make 50 cards and I didn't plan the size of the strip of paper correctly, and was short a few. The card I'd planned is the one on the left. For the remaining cards, I used a different pattern from the DSP package, and sponged over it with Creamy Caramel Classic Ink so it wasn't so terribly bright looking. I also used Creamy Caramel ink to stamp the foliage over the saying on the tag. To keep it light, I inked up the stamp, and then stamped it off three times before stamping over the words. Another tip you'll want to keep in mind is that the large flower, and the wheel image, both have script words on them--make sure you have them oriented in the correct direction on your card when you stamp them. You really need the Vintage Vogue stamp set (shown below), it's an instant year-round classic for any occasion. And of course, the Very Vintage Jumbo Wheel (shown below the stamp set) coordinates so beautifully, it's a must-have accessory. Don't forget to order the Jumbo Handle for the wheel if you don't already have it! Click here to SHOP NOW. 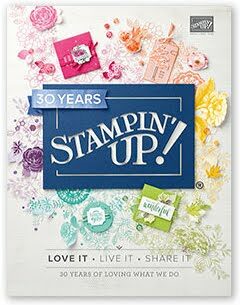 Stampin' Supplies: Vintage Vogue stamp set, Very Vintage Jumbo Wheel, Kraft card stock, Very Vanilla card stock, Bella Bleu Designer Series Paper, Not Quite Navy card stock & ink pad, Creamy Caramel ink pad, Stampin' Sponge, Scallop Trim Border Punch (FREE Sale-A-Bration item! ), Modern Label Punch, Big Shot & Lots of Tags Sizzlit 4-Pack, Vintage or Silver Brads, 1/16" Hole Punch, Stampin' Dimensionals, SNAIL. To get the ovals done, punch the Oval Punch out of card stock first, then punch the Wide Oval Punch around it, to get the "ring" shape. 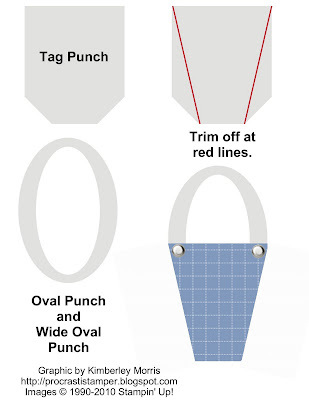 Be sure to turn your punch over to help you center the Oval Punch hole in the opening of the Wide Oval Punch. 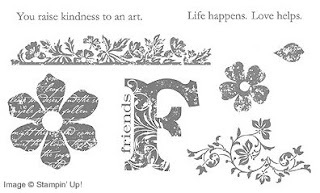 This graphic was made in about 3 minutes, using the punch images in the My Digital Studio computer program, now available from Stampin' Up! It's such a great digital crafting tool. Unfortunately, I don't have the opportunity to make a card for you right now, but I hope you can see this could also make a tall Easter basket. If you want it to be a pail, like the kind your kids take to the beach, you try adding a little shovel to it by modifying one of the arrows from the My Way Punch.